The Clemson community will come together to celebrate the beginning of the school year and kick off the football season at the annual First Friday Parade at 6 p.m. Aug. 31. The event, which features community groups, university departments, Panhellenic and service sororities, and other student organizations, precedes Clemson’s first home football game, set for 12:20 p.m. Sept. 1 against Furman. Monday morning’s University Convocation marked the beginning of the collegiate experience for more than 5,000 incoming freshman and transfer students. More than 1,800 graduate students are also starting their journey to master’s or doctoral degrees. The Blue Ridge yawns greatness yet again as Clemson University welcomes 12 students into the National Scholars Program. It is the program’s largest cohort in four years and includes eight students from South Carolina. The National Scholars Program aims to provide inquisitive student leaders with specialized enrichment opportunities. Selected students are presented a competitive scholarship, which covers the cost of tuition; provided the option to spend a summer studying abroad; advised in both group and individual settings; and prepared to thrive post-graduation. Clemson University’s PEER & WISE program is receiving the 2018 Inspiring Programs in STEM Award from INSIGHT Into Diversity magazine, the largest and oldest diversity and inclusion publication in higher education. The Inspiring Programs in STEM Award honors colleges and universities that encourage and assist students from underrepresented groups to enter the fields of science, technology, engineering and mathematics (STEM). 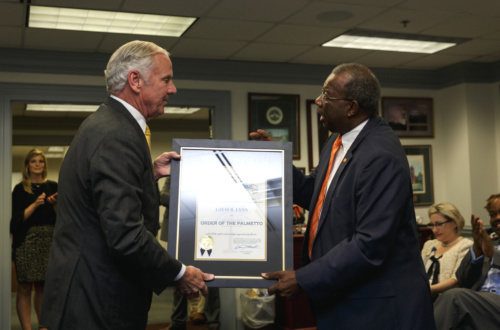 Clemson University Trustee Louis B. Lynn received the Order of the Palmetto, South Carolina’s highest civilian honor, from Gov. Henry McMaster Thursday. A group of Clemson University students in the nationally renowned Call Me MISTER program spent their summer vacations this year helping elementary school students improve their reading abilities and enjoy a camp experience they might not have had otherwise. Clemson University and the Medical University of South Carolina are teaming up to help educators, business leaders, medical professionals and others who want to learn ways to bring more diversity to or foster inclusion in their organizations. The South Carolina Diversity Leaders Best Practices Forum will be from 9 a.m. to 3 p.m. Aug. 9 at Clemson’s Sandhill Research and Education Center, 900 Clemson Road in Columbia. The Duke Energy Foundation is providing $85,000 to Clemson University to continue support of two separate summer programs that are aimed at increasing diversity in the pipeline that carries talent from academia to the workplace. The foundation granted $45,000 to Project WISE and $40,000 to PEER/WISE Summer Experiences. Physics students at South Carolina State University will be able to earn their bachelor’s and master’s degrees in just five years as part of a new dual-degree program with Clemson University. Undergraduate physics students will study at SC State for three years, then transfer to Clemson University, earning a bachelor’s degree from SC State and their master’s degree from Clemson by the end of the fifth year thanks to a new agreement between the schools that leaders signed Thursday. Students and faculty hope to unearth remnants that help tell the stories of the men, women and children who lived and worked as slaves during the antebellum era on the Fort Hill property on what now is the Clemson University campus. There will be a drop-in at the archaeological site where they are digging from 10 a.m. to 1 p.m. Tuesday, June 19, to commemorate Juneteenth, which marks the emancipation of the last remaining enslaved people in the United States. Clemson professor Mike Coggeshall recently released a new book, “Liberia, South Carolina: An African American Appalachian Community," to shed light on the history of five generations of a family, their friends and neighbors and the freed slaves who founded the Pickens County community. He will sign copies of the book at Soapstone Church from noon to 3 p.m. this Saturday, June 16.